Looking for a tasty, frugal meal that's a snap to make? 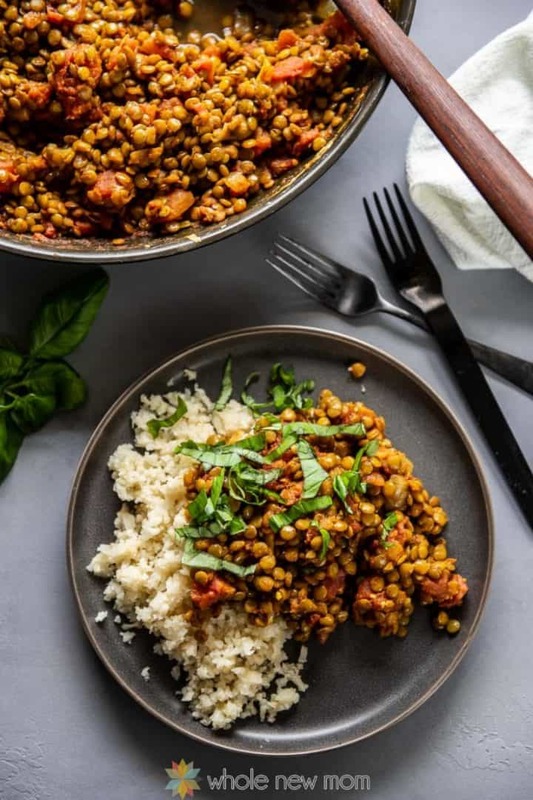 One taste of these Easy Indian Lentils and you'll be surprised at how satisfying and delicious lentils can be. 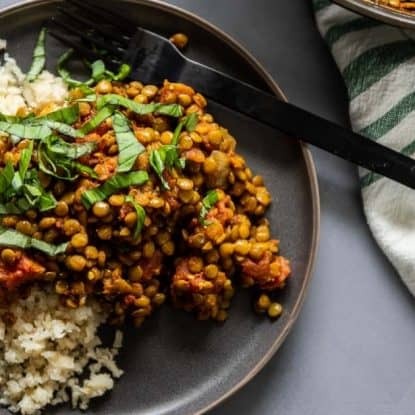 This savory lentil dahl recipe is a vegan stew that is rich, hearty, and delicious, but also super simple and inexpensive to make. In fact, though we like experimenting with cuisine from all cultures, I would say that Indian is one of our favorites. 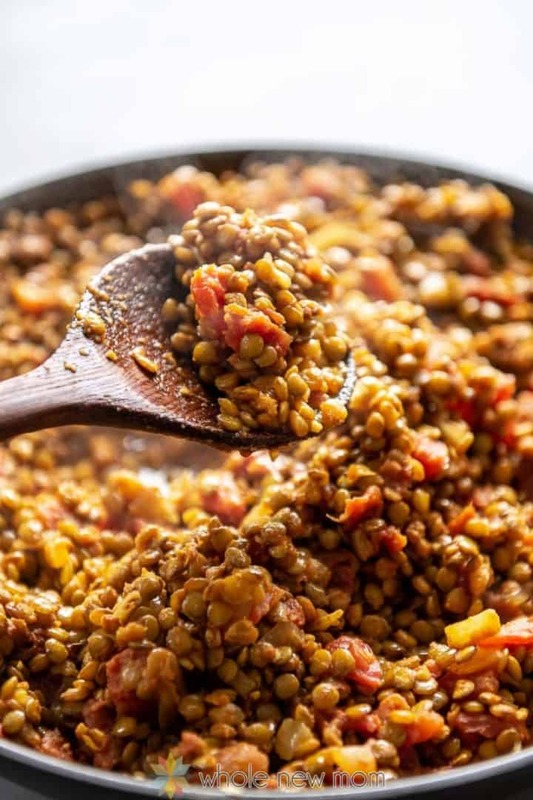 Now, before I go on, let me say that this lentil recipe isn't an intense, hot and spicy curry – so don't run away if you think that you are not a curry fan. Really–you don't know what you are missing. Most people who don't like curry don't like it due to its being spicy. This dish is not that, and in fact, it feels like a real comfort food to me. In fact, there another recipe on my site that actually does feature curry and that is in fact my most requested recipe–Pakistani Kima. Think you don't like curry? 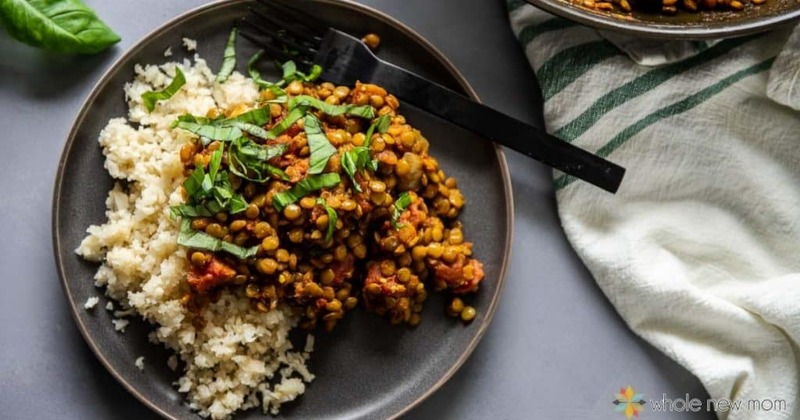 You really should try BOTH of these recipes (these Indian Lentils and the Pakistani Kima). I think you'll be pleasantly surprised. So you love Indian food like I do, right? However, we all know that making Indian cuisine can be quite time consuming. So when I can get the taste of Indian spices in a fast, one pot meal, then I get the best of both worlds. I can have my cake curry and eat it too. ‘Cause these days, who has a lot of time to spend in the kitchen working on seemingly endless elaborate steps? I have many other things that need to be done. Like photo albums. Those need to be done. Please don't ask how many years behind I am. I need to start a support group for moms with empty photo albums :-). Care to join me? Anyhow, back to the recipe. This recipe is adapted from a dish simply called “Red Lentils” by Southern Living. It's a pretty “Blah” name for a truly amazing dish. It's quick on its own, but really lickety-split in my pressure cooker. If you don't have one of these yet, put it on your Christmas list now. I know, I should get better at planning meals, but it sure is nice to not have any idea what you are going to have for dinner at 5:30 and have dinner on the table at 6:15. Well, with this recipe, you can get it done. 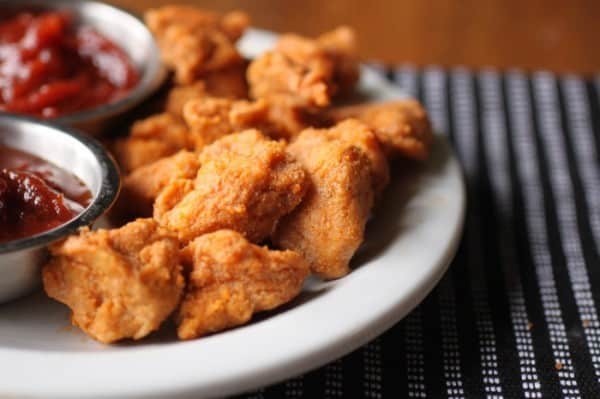 You can literally have an amazingly delicious meal on the table–without resorting to packages filled with preservatives and who knows what else. Done. In a fast 30 minutes on the stove top, or 9 minutes in the pressure cooker. Mom is happy that she didn't resort to serving boxed cereal (that might have paint thinner in it??) and toast, and the family is happy because they aren't having popcorn, carrot sticks, and hard-boiled eggs (or sardines for my egg-allergic son) again because mom forgot to plan :-). Yes, I know, you all are wondering why we don't just order a pizza, right? 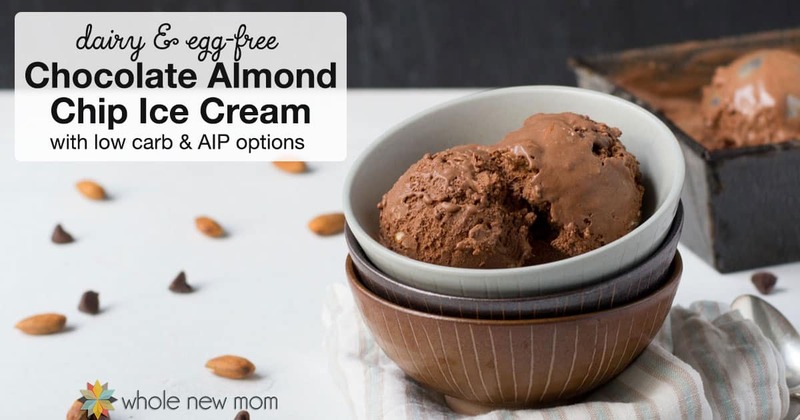 We're all gluten-free and oldest is also deathly allergic to dairy, so that's why…. Daal (which can also be spelled Dal/Dahl/Dhal) is a stew of lentils, cooked with delectable spices. Many dahls are made with red lentils, that interestingly turn yellow when cooked, and then are served with Naan. Naan is a popular soft Indian flatbread that you will have had if you’ve ever been to an Indian restaurant. 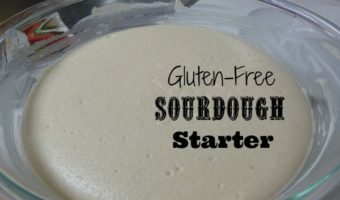 Our family is gluten-free, so you traditional Naan isn't ever on our table, but I plan on developing a gluten-free or grain-free Naan, and in the meantime, as mentioned below, the flax bread on my blog tastes great with this. You could even wrap these Indian Lentils in these Buckwheat Pancakes as well. Here are some other of my super fast recipes that are “go to's” when I'm short on time. This dish tastes great served over rice (which, by the way, I can cook in 20 minutes flat in my pressure cooker. Woo-hoo!) I always use brown rice due to its higher nutritive qualities. There is some concern about arsenic in brown rice so source carefully or eat white rice if you prefer. 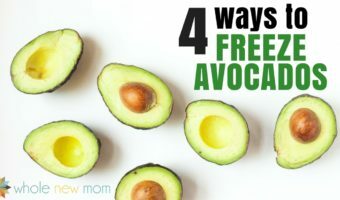 It would be fabulous over gluten-free pasta or spiralized veggie noodles too. Naan is the perfect accompaniment for this Indian Lentil recipe. If you're avoiding gluten, you can make or purchase a gluten-free naan or make this Focaccia Flax Bread for a gluten-free flatbread option. 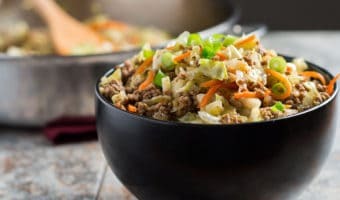 Cauli rice is the perfect low carb / grain-free option and is what is pictured in the images on this post. Next time I plan to add seasoned chicken pieces to this dish. 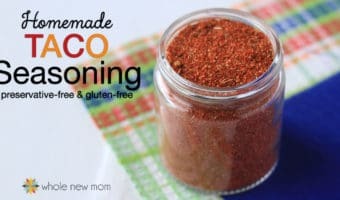 Specifically, I think that sauteing small chunks of chicken in coconut oil and my Homemade All-Purpose Seasoning would be a wonderful addition. My Chat Masala spice mix tastes great on this. We have this on our table at all times and put it on everything. Except – ahem – desserts :-). If you are like us and you just LOVE curry dishes, see my recipe for Sweet Curry Powder – DIY – it is real winner and great money saver too. 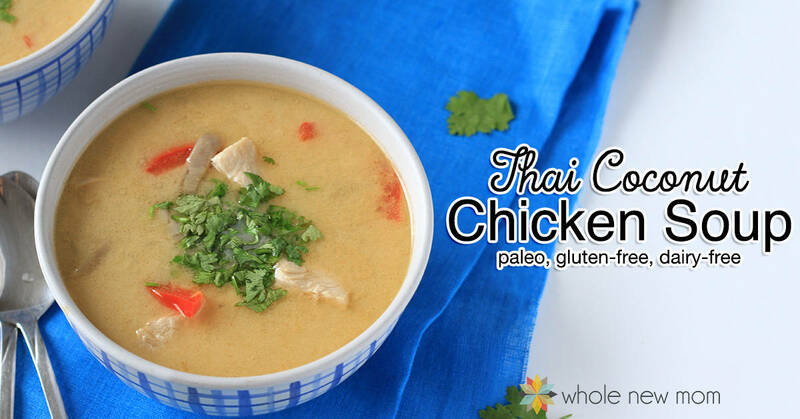 You can add it to so many dishes, including this one. Just trade the turmeric and cumin for the curry. 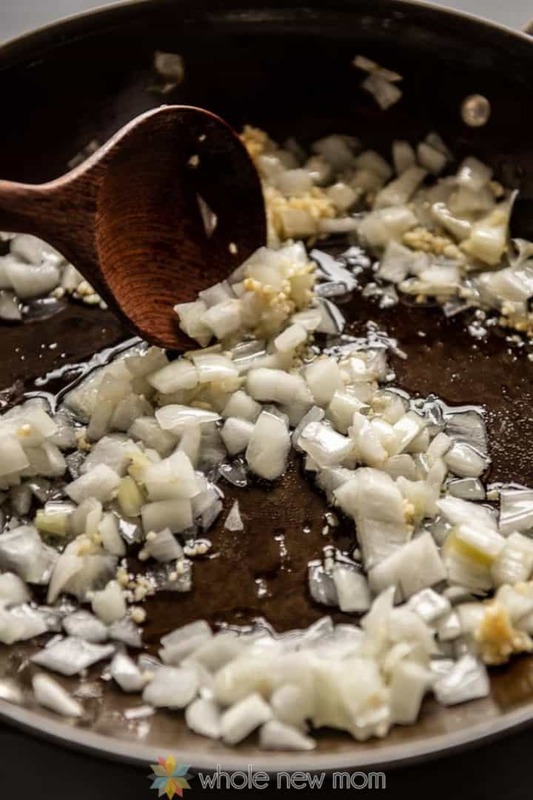 Instead of fresh onion, you can use 2 Tbsp minced onion plus a bit of water to reconstitute. Here is a great place to buy bone broth. You can also find the same brand on Amazon. Vegetable broth is also fine – see my Homemade Vegetable Broth Mix. 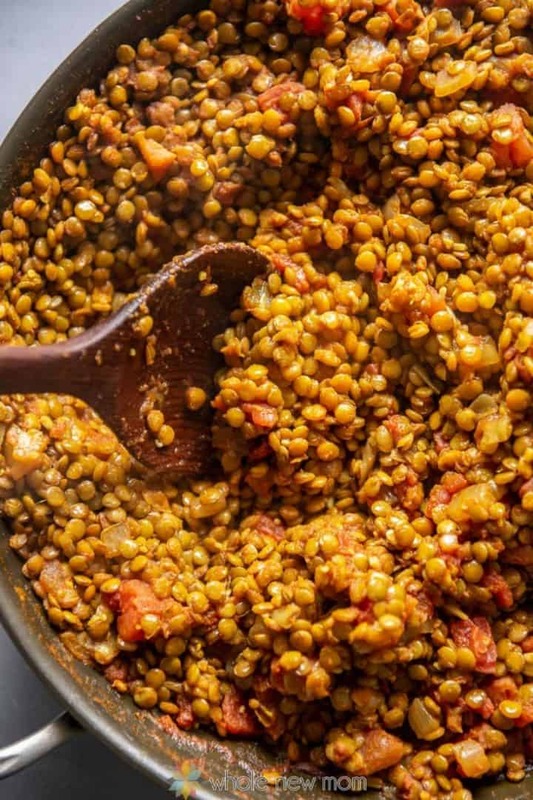 Although this recipe was originally meant as a red lentil dish, you can use any kind of lentils and the main photos were taken of the dish made with traditional lentils. 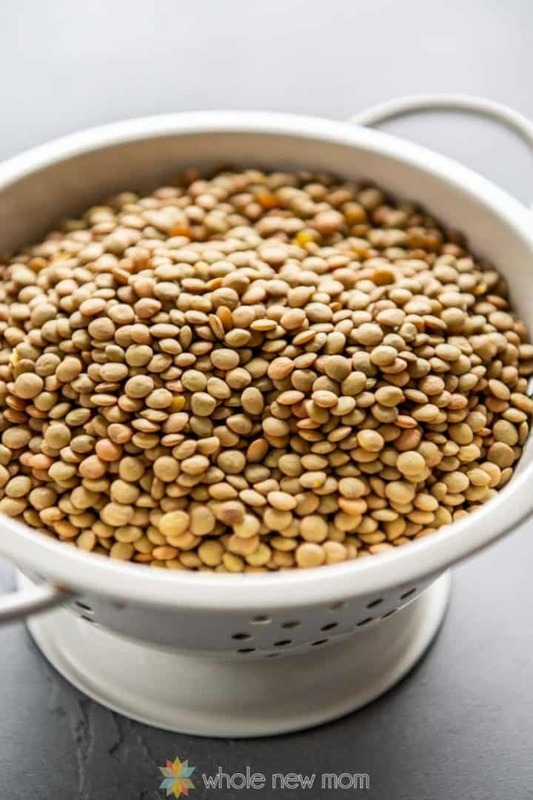 The glycemic index of red lentils is a higher so brown is a better choice if you're watching carb intake.Make sure that you read my post on How to De-Gas Beans. It's a must! The lentils in the following photo are red lentils. Note that red lentils turn yellow when cooked. You can use fresh or dried basil, but fresh will yield a more dramatic flavor and presentation. If you choose to grow your own herbs, this post on the how to preserve herbs shows what to do with your bumper crop. 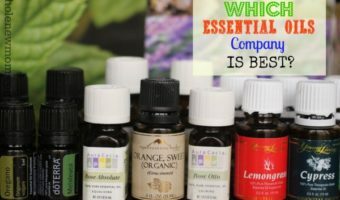 If using dried, substitute in 2-3 Tbsp organic dried basil. The cook time in the recipe card is how long it will take if you do not own a pressure cooker. If you do own one, the cook time will be around 15 minutes less, but you will have a wait time of about 10 minutes since the pressure needs to go down. 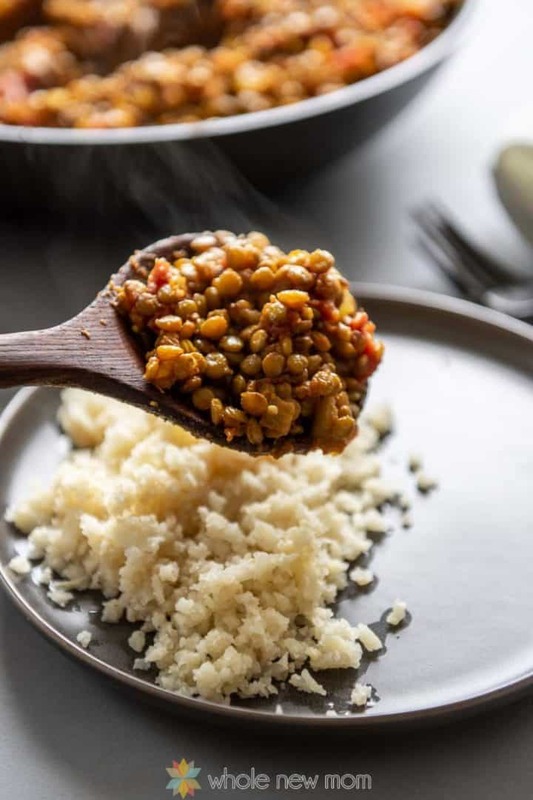 This Indian Lentil Recipe is ready in a flash and is a rich, hearty, and delicious frugal meal that everyone will love. 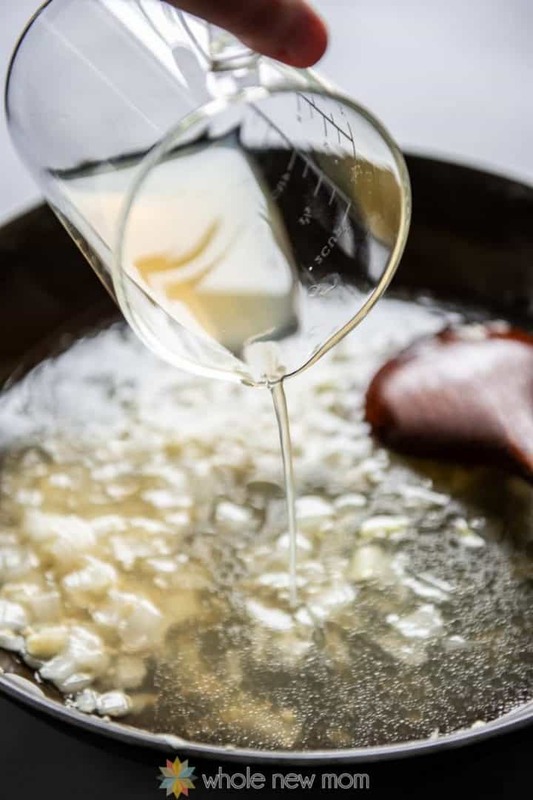 Melt oil in a large, heavy pot over medium heat. Add onion and garlic. Saute 5 minutes or until the onion is soft. Add broth and next 5 ingredients. Bring to a boil. Reduce heat to low. Add lentils and bring to a boil. Place the lid on the cooker and bring up to high pressure. Cook for 9 minutes on high (you may need a few more minutes since the tomatoes counteract the cooking of the lentils slightly. Conversely, you could add the tomatoes after cooking the beans and then let the resulting dish cook for a bit). Let pressure come down naturally. Remove lid carefully. Stir in basil and salt to taste. Wonderful, fast, savory Indian cuisine in no time! What would you serve with these Easy Indian Lentils? Hi I am from India and it’s delicious ???? So great – thank you!! Cant wait to try it! Just one question: It calls for 1/2 CUP of basil? Is that right? Dry or fresh? Editing the post right now – good question. It’s fresh, but you can substitute in dry. Made this today. Added 1/2 tap paprika as well. Soooooo flavorful. LOVED it, thank you. 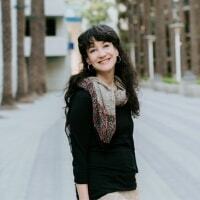 Great addition – so glad you liked it! Can you make this without a pressure cooker? You can do any pressure cooker recipe in a pot. It will just take longer. Hope you like it – we haven’t had this in forever and we love it.